The Norwegian Getaway has over 20 different venues on the ship where a guest can buy a drink. These venues include bars, lounges, and entertainment spots. The atmosphere varies from a quiet place for a romantic drink to a fun party with hundreds of your new friends. 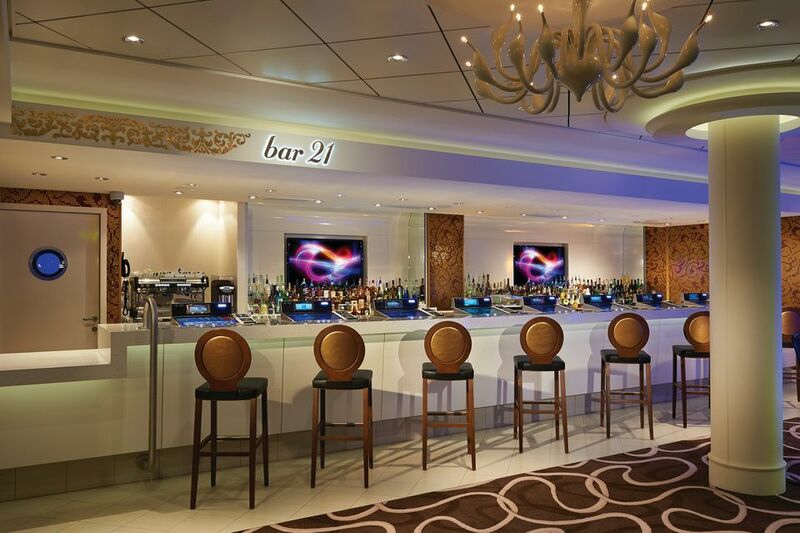 Bar 21 in the photo above is found in the casino and is the ship's smallest bar, with only 8 seats. For those who don't want to take a break from their gambling, Bar 21 has video poker. One great new area for having a drink is on The Waterfront, with three of the lounges featuring outdoor seating. The concept of indoor bars that flow into the gorgeous outdoor deck areas is perfect for cruise ships. Past Norwegian Cruise Line guests will recognize the Bliss Ultra-Lounge name since it's been used on other Norwegian ships. Bliss on the Norwegian Getaway is a little different since the lounge looks much like a trendy South Beach club, with an illuminated bar and pulsating dance floor. For those who are not too tired after a day of touring ashore or having fun on the cruise ship, Bliss is a fun disco spot to dance the night away! If the walls and bar seem to be glowing, don't worry. You probably haven't drunk too much; they are supposed to glow. The Headliners Comedy Club on the Norwegian Getaway has 12 shows per week from two groups of performers. The first group is the Howl at the Moon Dueling Pianos Show, who perform songs from the 70s, 80s, 90s, and this century. Guests sing along and do some howling of their own! The second group of entertainers are comedians from the Levity Entertainment Group. Headliners is well-designed for comedy with its small raised stage, concrete floors, and brick walls. Guests can laugh the night away, enjoy some music, and have a good drink. Ice bars are great fun, and I've visited four--one in Stockholm, St. Petersburg, the Norwegian Epic, and the Norwegian Breakaway. This ice bar (like many of the venues on the Norwegian Getaway) has a Miami Beach theme, but this one has a twist--it's frozen. The bar, walls, tables, and seating are all made of ice. Since the temperatures are 17 degrees Fahrenheit, parkas are provided for the trip inside. Visitors don't have to worry about getting cold, the venue provides warm coats. The Mixx Bar is on deck 8 aft, near the Savor and Taste Restaurants on the Norwegian Getaway. Mixx's location makes it a busy place to see and be seen. It's also a great place to meet friends before or after dinner. Prime Meridian is located between Moderno's and Cagney's on deck 8 aft on the Norwegian Getaway. The location is centrally located, which makes it fun to sit at the bar and check out the action in the two restaurants or at 678 Ocean Place. The Sunset Bar is on the Waterfront on deck 7 midship of the Norwegian Getaway and features both indoor seating and outdoor seating on The Waterfront. The name and decor were inspired by Ernest Hemingway's Key West. As the name implies, it's also a good place to catch the nightly sunset. Doesn't the name of this bar make your mouth water? The Sugarcane Mojito Bar on the Norwegian Getaway is in an island-themed setting and features indoor and outdoor seating on The Waterfront. Cigar smokers can light up and enjoy a drink in the Humidor Cigar Lounge on deck 8 midship on the Norwegian Getaway. It is one of the few indoor spots that allow smoking, but the cruise ship also has outdoor dedicated places for smokers. Spice H2O on the Norwegian Getaway cruise ship is more than an outdoor bar and lounge. It's a great entertainment space, with live entertainment, dancing, and videos/movies on the giant screen after dark. In the daytime, Spice H2O is a relaxation area, with lots of lounges, hot tubs, and even a waterfall. Adults will especially love that it is only for them--no kids allowed.